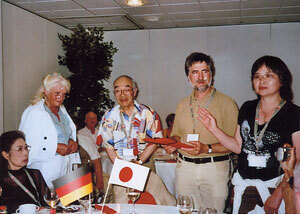 On January in 1997, 20 artists with Yuji Shirao as leader who have intention of activity of international cultural exchange gathered to discuss about establishment of ａ new art association. Then,in February they announced the exhibition of group named Salon du Blanc 21 at Ginza Gallery Chikyudo. and exhibited 29 art works, which was the exhibition taking the initiative towards the 21st century. In May, "Salon du Blanc Art Association" was founded with 75 members and held the exhibition at Gallery Sunflower exhibited 25 works. As the year of 1997 was the Year of Japan in France, Festival Arts & Musique Franco-Japonais de Millau took place at Millau France in September with support of Millau city, and 62 French artists who were representatives of each salon in France and 42 artists of Salon du Blanc exhibited their works jointly. It was favorably noticed by 17 press agencies. Since the first exhibition, we have been dispatching Exposition d' Artis Contenporains Franco-Japonais from Omori Bellport Atrium, the palace of beauty, to the world. At the 5th anniversary exhibition in 1901, French artists with Mr. Jean-Maxime Relange as leader exhibited 52 works, and 10 Canadian contemporary artists exhibited their works in cooperation with Global Canada Cultural Ｅxchange. The total number of works exhibited together with Japanese artists reached over 300. In 2002, the exhibition took place at Champagne, France, by invitation of the art association of Champagne and we exhibited 70 works and we could enjoy cultural exchange with French artists. 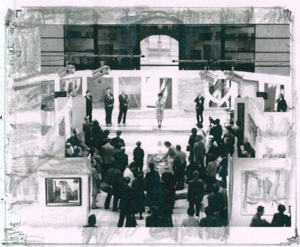 Then in 2004, the exhibition took place at Alsace and ７０ works was exhibited by French artists and us jointly. In 2005, the exhibition could take place by invitation of art association in Hofheim, Germany, and 67 works were exhibited by our members. By taking this opportunity, I wish to express my heartfelt appreciation for their invitation. In this time, I am glad to meet 7 members of the association again in Tokyo.